Tim and Kevin just left. They are two terrific guys and did a fantastic job. Our Entry Brite entry is stunning!! Although I wanted to send some pics, my phone camera can’t come close to capturing the true beauty of your product. Please ket Jeff know what amazing assets Tim and Kevin are. 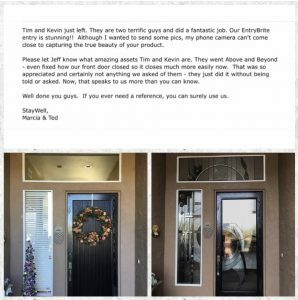 They went Above and Beyond -even fixed how our front door closed so it closes much more easily now. That was so appreciated and certainly not anything we asked of them- they just did it without being told or asked. Now, that speaks to us more than you can know. Well done you guys. If you ever need a reference, you can surely use us.